I have been toying around with upgrading my stock seats. 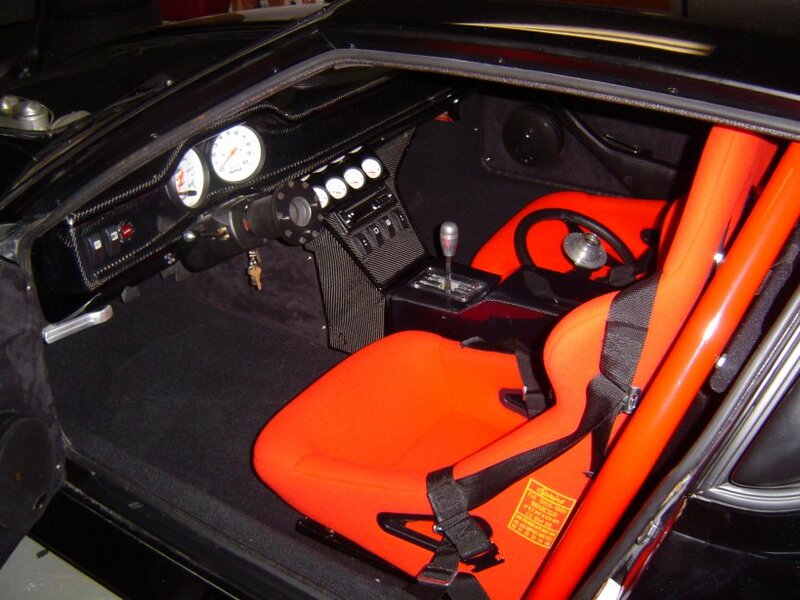 I have looked at numerous posts about using C4 corvette seats. I also noticed a few regarding C5 seats. I was wondering if someone running a C4 or C5 seat could tell me how close the back of the seat is to the ceiling (roof) of the car. I am guessing that the Corvette seat back sits pretty high in the car and was wondering how that looks from inside and also outside the car. Also are you running a stock seat track that was modified to fit the corvette seat or something else? If anyone has any photos they would be much appreciated. Also any other thoughts or suggestions are welcomed. Sitting in the stock Pantera seat, with non-dropped floor pans, my head is only 1.5” away from the headliner. When I decide to change my seats, my car already had Scheel seats and I couldn't imagine putting factory seats in my car. I've checked out the diffent options - C4/C5, Recaro, Flofit, et cetara and decided on the Fiero seats with a rebuild kit I bought from MrMikes. 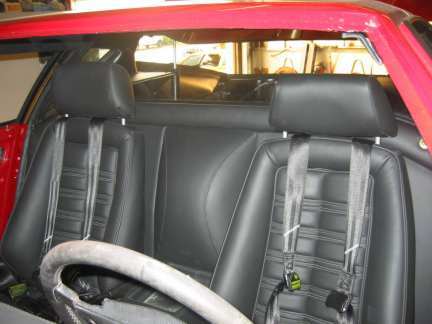 This exterior shot shows how high the seats sit in the car using the Pantera seat tracks. The stock fiero seat tracks make them sit too high. Additional pictures of my car can be found on MrMikes website (www.mrmikes.com)as well as a couple of other Panteras with the same seats. Nice seats. What kind of seat belts do you have? I'm tired of digging around on the floor looking for the damn female belt! Hate when that happens! 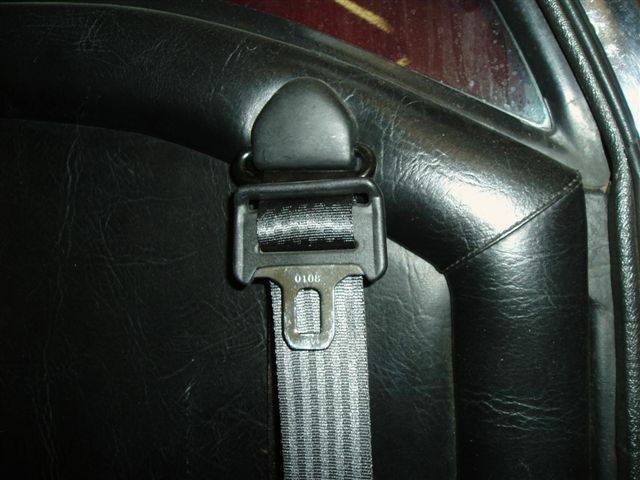 What kind of seat belts do you have? I'm tired of digging around on the floor looking for the damn female belt! Hate when that happens! The seat belts are for a Grp5 but I've seen the same stalks for the locks on an early MBZ and some other cars. I'd have to check as I forget the manufacturer. 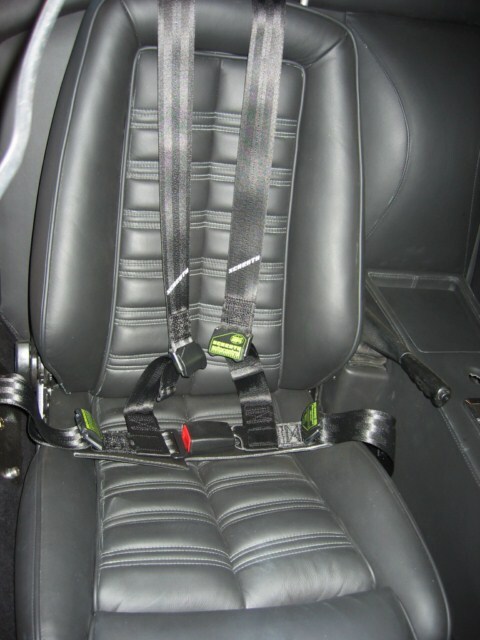 I gave up on the 4pt harness I used to have after I converted to the Fiero seats (not practical on a street car). 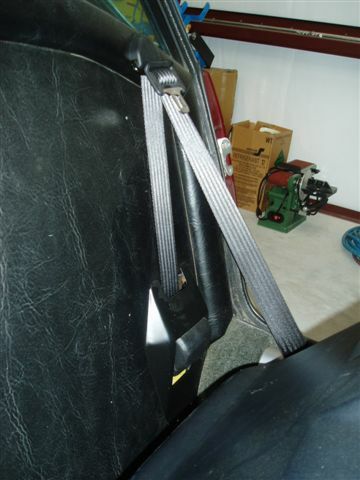 4n, I built a pair of seatbelt end "holders" from late '80s Ford pickup belt holders, cut down to perfectly fit a Pantera. Practically speaking, you only need holders on the inboard ends for both driver & passenger. There was an illustrated article on what to do and how to do it in the POCA News of May 2008. I mounted the single inertial retract mechanism to the rear bulkhead in the stock location. I had to cut a 'window' in the stock fairing cover for the larger mechanism. I removed the rocker area retract mechanism and mounted the end of the new belt to the stock steel plate. The female receptor is on a semi rigid cable like the factory GT5S. It's mounted in the stock location with an 'L' angle. What a difference over the stock Pantera set-up. Female receptor. No fumbling trying to find it. LIV1S your seats look great. I actually have access to an old junk Fiero that that I could pull the seats out of. Do you remember how much the seat kits were from Mr. Mikes. I just looked at his site, however, there are not any prices listed. I did the upgrade a couple years ago and I believe the cost was around $700 which included your choice of style and the embroidered Isis logo in your choice of color. The kit was very detailed and included a DVD, hog ring pliers and rings. If you do decide to go with the kit, I can look up the actual price I paid. Garvino, I went the Mr. Mikes Fiero seat route as well, but I ended up having to bolt them to the floor with no tracks. Even had to cut the carpet out around to bolt holes to get just a smidgen more headroom. I'm 6' tall with a long torso and as it is, I barely fit in the car. Depending on your height, this could be a problem. You could substitute thinner foam on the seat bottoms for more headroom. I think I paid $550 for the kit and another $50 for the seats. Mine have the speakers in the headrests and this helped the stereo immensely. I put new speakers in the headrests before recovering them, so that is an additional expense. I'm not sure where you are in Wyoming, but I'm in Greeley CO so I might be just down the road from you. You're welcome to come over for a test fit before you buy. Might save you some dissapointment and expense! When even considering buying a Pantera, the primary question should be 'How tall are your?' Are they trying to say that all italians are 5'9" or shorter? 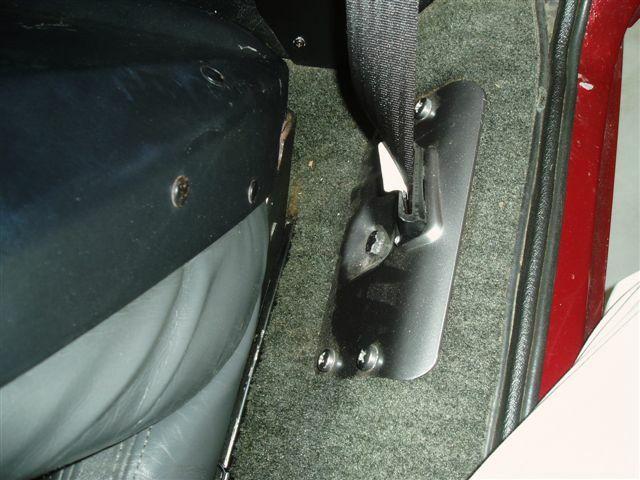 When I installed the Fiero seats, I had to use a Pantera bracket as the Fiero brackets would cause the seats to sit too high for me. FWIW, there are three different 'stock' seats (and maybe more!) that come in various years of Panteras. IMHO the earliest examples from '71-72 can be made to comfortably fit nearly any human being. The seats I like are the ones in which the backs completely remove with 4 bolts; the rear fastener system can be easily modified to change the seatback 'rake' which will accomodate most comfortably. Reupholstered examples allow my aged 6'2" body to drive 6-8 hours at a stretch and change with my 5'4" wife who also has no back or seat problems. 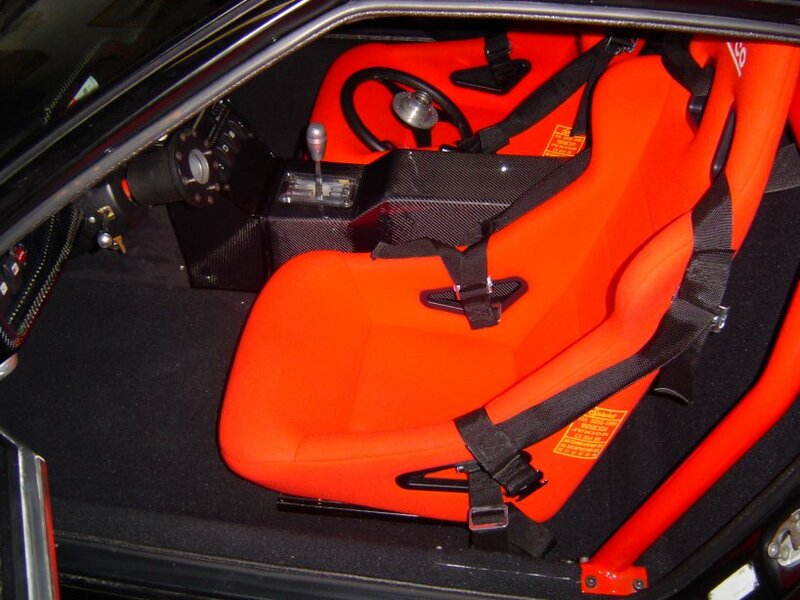 Most aftermarket seats often simply do not fit well in the Pantera which has rather narrow seat areas. Rule of Thumb: if you are 6' or over, avoid ALL seats that have thick backs or bases; both limit the adjustability of whatever seat you choose, and carefully measure the overall width of the donor seat before buying. What fits the drivers side may not fit the passenger side- or your co-driver. I just had the conversation about seat fitment and according to Steve Wilkinson, the seat base width is limited to around 19" on the passenger side and 20" on the driver side. That limit is for the very bottom of the seat. I have Gary Herrings Corvette seats and love them. However, I have a set of cut down in height Ford GT seats I am going to go with. Only reason is the weight savings since they are real carbon fiber based. Where did you find those GT seats? Do you know what model they are; and if there are any around? Are you going to install tracks on them as well, or just bolt them to the floor? If you are going to use tracks, where does one find these? The seats are from the Shelby Cobra roadster concept vehicle used in a movie. Ford provided the movie makers with the details of the concept car and the seats are custom made by Sparco using the original design. The seats actually say Ford GT on the Sparco production labels since they are modified Ford GT buckets. The difference is in the movie the seats have the Sparco company name on them where the original concept car does not. Steve likes them and he has a call into Sparco to find out if he can order any. My expectation would be Ford owns the rights. Ford GT seats themselves are priced too high in my opinion. There is a set of Ford GT seats used on Ebay for $5000. I have heard that new ones are about twice that. I haven't decided on the mounting but Sparco makes universal tracks. Hi folk's, like Garvino, i'm looking for new seats for my pantera. 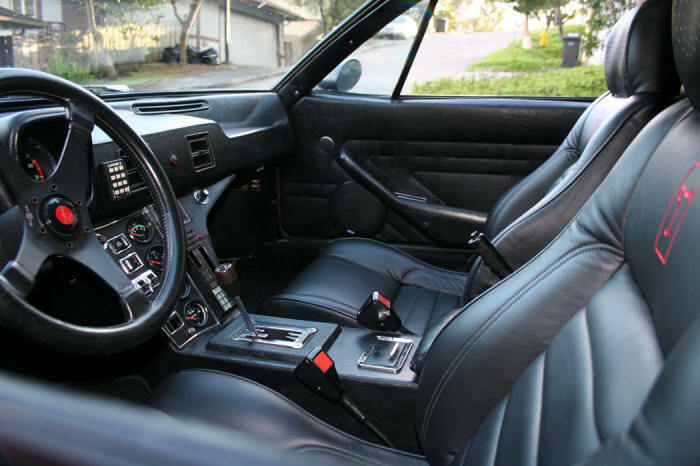 As somebody ever fit NRG bucket racing seats or 3A Netami seats in their pantera (actually on sale on Ebay)...How they fit in the car, how much free space between the center console + the seat + door panel? are they comfortable? Needed to put drop floor pans? Thanks for all the comments and photos so far. If there are any other photos out there of other seats being utilized I would appreciate it. 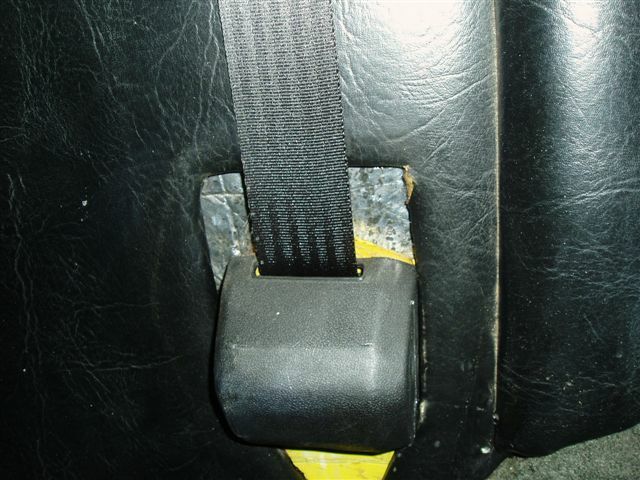 I also am considering the FJ seatbelt conversion that CAT7195 did. It looks pretty slick. BTW – Mooso – I am out of Casper and am actually headed to Denver in the beginning of September. If there is anyway I could swing in real fast and sit in your Pantera that would be great. I think it would really help me out with the decision making process. Thanks again everyone for your input. 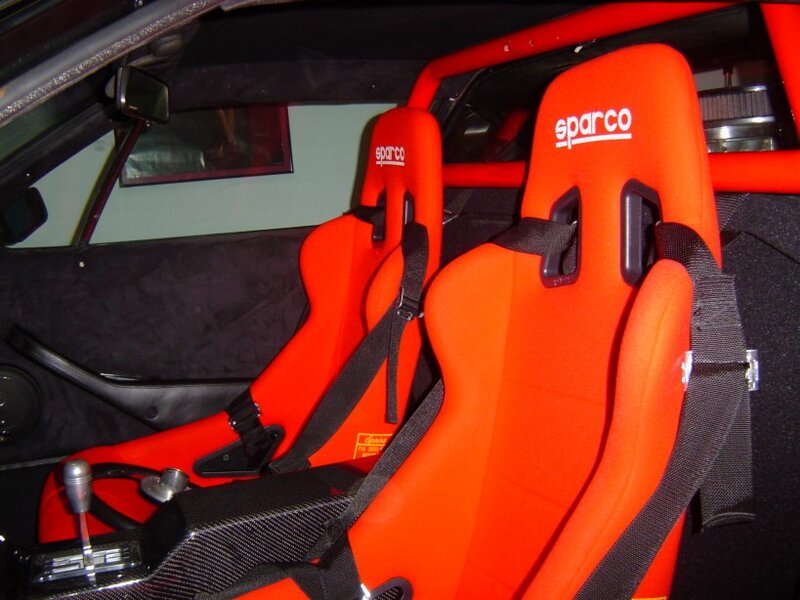 They are not the racing seats you named but they are sparco racing seats. I am 6 foot tall and fit very well in the seats. They do hold you in place when going around turns. My pantera has dropped floor pans. Also the front of the seat have a 1 inch spacer in the fronts to tilt the seat back. 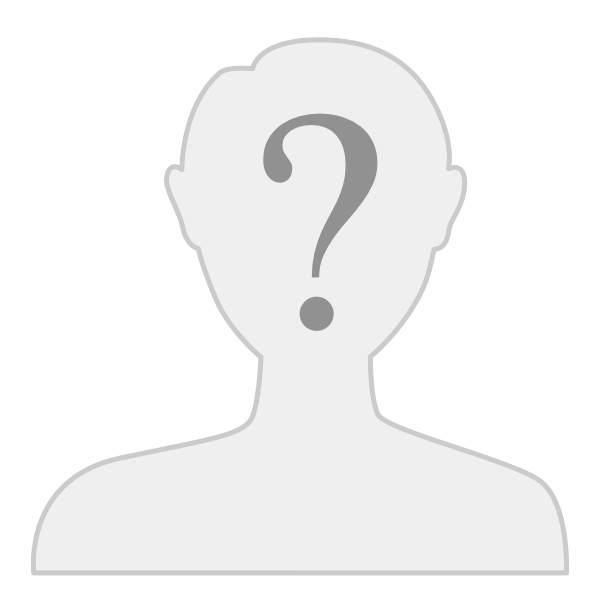 Garvino, just e-mail me at mmooso@aol.com and we'll get together when you come through. Thank's Mark for your input and pics. As per your request, here are some photos of my seats. They are old (1970's) Recaro's that I had upholstered as you see in the photos. A fellow Pantera owner gave them to me because he has a factory Group 3 racing Pantera and wanted real racing buckets. The seats were a mess but after buying all new plastic parts from Recaro and having them upholstered, they look like new. They fit the Pantera like they were made for it and look like they belong in the car. More important than how they look is how they feel. They fit me like my favorite pair of jeans. I was lucky enough to get them with the Recaro Pantera tracks but adapting other tracks would be pretty easy. These seats were popular in the '70's and were even OE in some BMW's. I see them on eBay on a regular basis and they're always cheap ! Check out eBay auction number 230505808827 as an example. Thanks for the pics. Your seats look great. Do the Recaro seats recline and fold forward? Also how high do the seats stick up past the bulk head and protrude into the window area? One seat I looked at would only have about one inch clearance between the roof of the car and the headrest top. Yes, the Recaro's recline and fold forward. You can either adjust them forward, a bit at a time, or "dump" them all the way forward. I can even remove the bulkhead without removing the seats. See the attached photo for the answer to your headrest clearance question. I do; however, have two modifications that you should take into consideration: I have the Amerisport bulkhead reduction kit as well as lowered floor pans. The bulkhead reduction kit doesn't affect the driver's seat at all. It allows the passenger seat to recline further back. My lowered floor pans were custom fabricated and only drop the floor by 1-1/2", so you can see in the photo that the seats would be fine without the drop. Beautiful job on the seats David and definitely look like they belong there. How did you resolve the issue with the clearance of the passenger and the handbrake box? Thanks! With these Recaro's there is no issue with handbrake box clearance because they're quite thin. If you look at the photo in my first posting under this thread, you can see the handbrake in its original location. Thanks David. 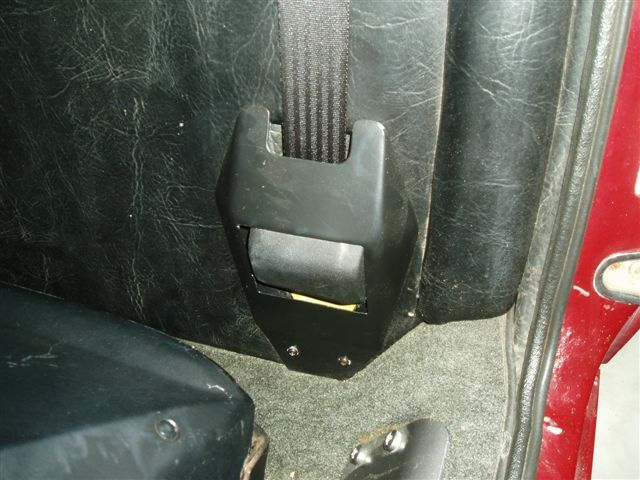 Handbrake box clearance is an issue I had with the Fiero seats I installed. I've considered removing and narrowing the box so the passenger seats will roll all the way back but It'll have to wait until I get around to doing the bulkhead reduction that you did. Brilliant solution Jack! This definitely comes under the heading of why didn't I think of that before? Beautifully simple. I have a question - you suggest angling the seat and not worrying about making it parallel - do you suggest to use the original bolts/holes that anchor the front of the seat rails to the floor? Wouldn't that lead to a 'trapeizoide' effect on the rails that would affect how the seat slides, or don't you think the angle would be a problem. Wouldn't that lead to a 'trapeizoide' effect on the rails that would affect how the seat slides, or don't you think the angle would be a problem. Nope, the two sliders still remain parallel and slide as before. Thanks Jack.... That is an alternative I will definitely consider. Probably easier to make offset studs to gain the clearance I need than to mod the handbrake box. I did try to offset the driver side to get a more central steering wheel position but it left a too big of a gap between the driver seat and the inner rocker panel hump so I decided against it. I still try consider aesthetics I'm afraid. 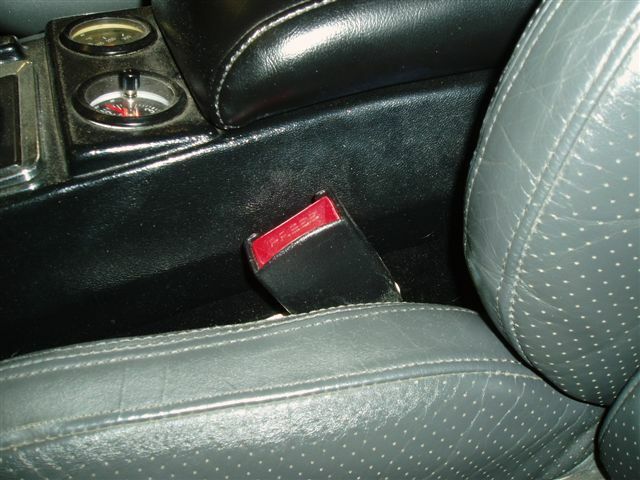 When I installed my Corvette seats I offset the passenger seat 3/4" toward the passenger door to clear the hand brake mount box. I am going to have new leather seats constructed this winter. I would like to see as many pix as possible to help me determine what design to have built.